I recently started using a few John Frieda hair products to brighten my hair and I’m so excited share the results with you today. Specifically, I’ve been using the Brilliant Brunette® Visibly Brighter™ Subtle Lightening Shampoo and Brilliant Brunette® Visibly Brighter™ Subtle Lightening Conditioner. I’m also using the Brilliant Brunette® Visibly Brighter™ In-Shower Treatment, which instantly brightens hair with just one wash! Together, these products have given me fabulous results and have encouraged me to do something special with my now-fabulous hair! 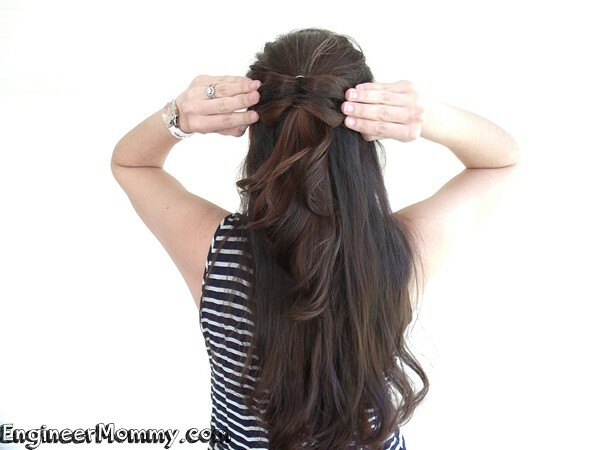 I’m going to show you how to get heat-free waves overnight and also how to use your own hair to create a hair bow! 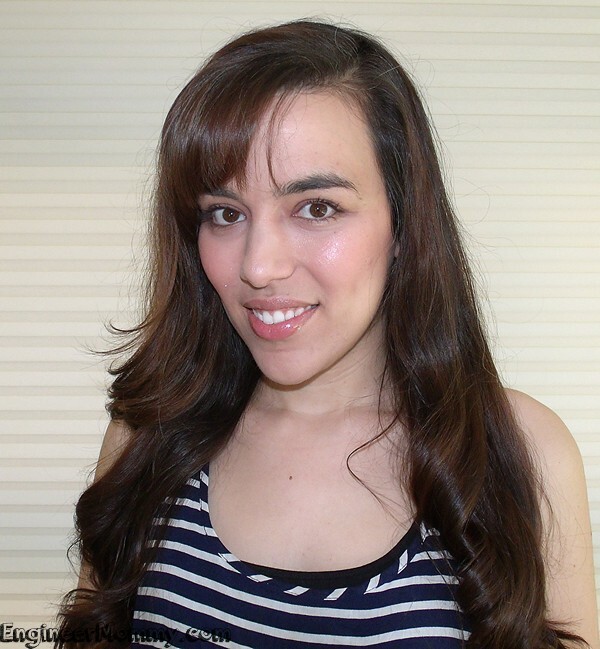 When I first started using the John Frieda products, I wrote all about it here. I love that by using these products, I can skip the pricey trip to the salon but still get beautiful hair colour from home. I love that the Visibly Brighter™ Shampoo and Visibly Brighter™ Conditioner gradually brighten the hair for a beautiful natural-looking brunette. 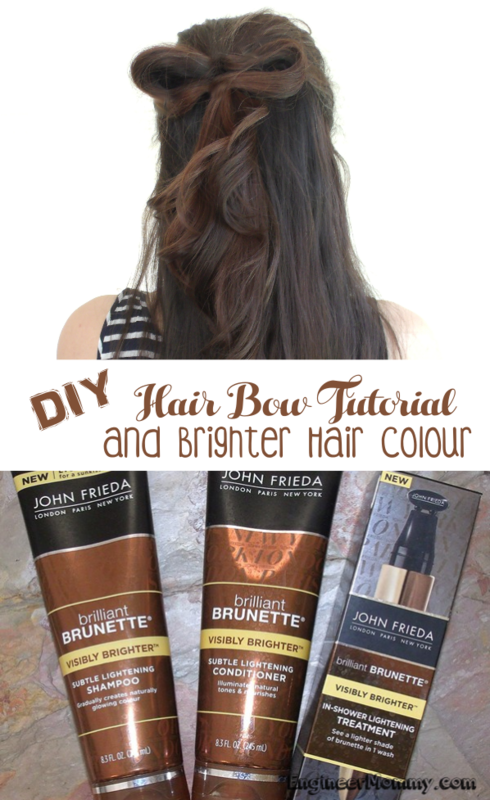 In fact, they actually boost the brightness of the brunette on a daily basis! The Visibly Brighter™ Treatment is another fabulous product that instantly lightens hair up to 1 shade! The best part? It only lightens your natural spectrum, so hair will not appear bleached or orange at all! To keep my hair looking healthy and vibrant, I try to avoid too much heat styling. That’s why I was excited when I realized I could get loose waves overnight without applying any heat to my hair! It’s a really simple process and I can’t wait to share all the details with you! Start by putting your hair up in a high ponytail. 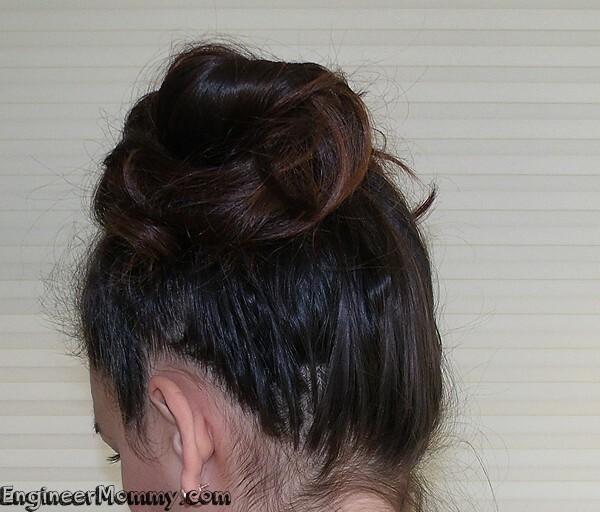 *Tip: Place the ponytail on the top of your head so that it doesn’t interfere with you if you sleep on your side or back. 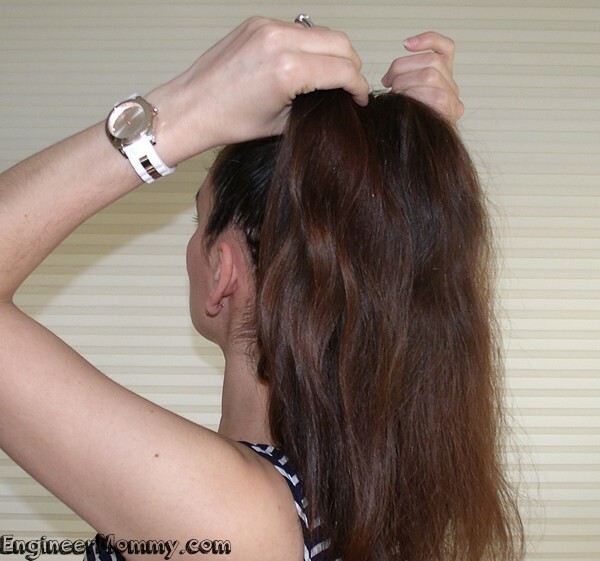 Next, divide your ponytail into roughly 4 or 5 sections. 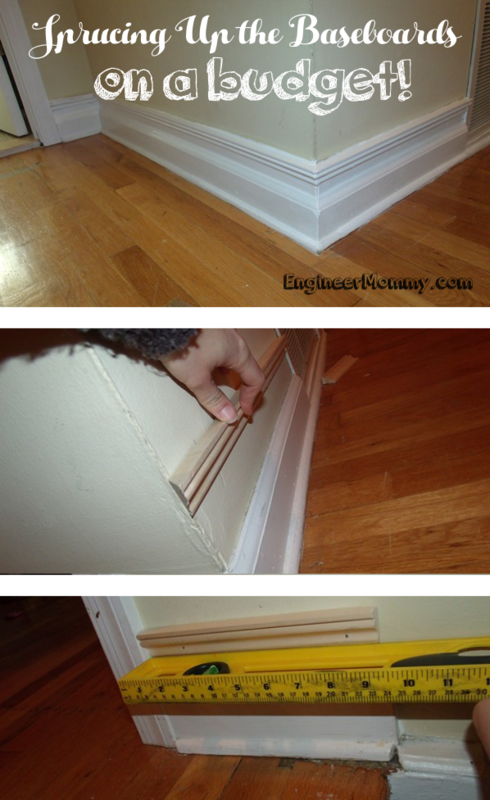 Take one section and spray it lightly with some water. Using three fingers, wrap the hair around your fingers. Secure with a few bobby pins. Repeat with the other sections of the ponytail. Leave your hair untouched for several hours… preferably overnight! In the morning, start by removing all the bobby pins in your hair. 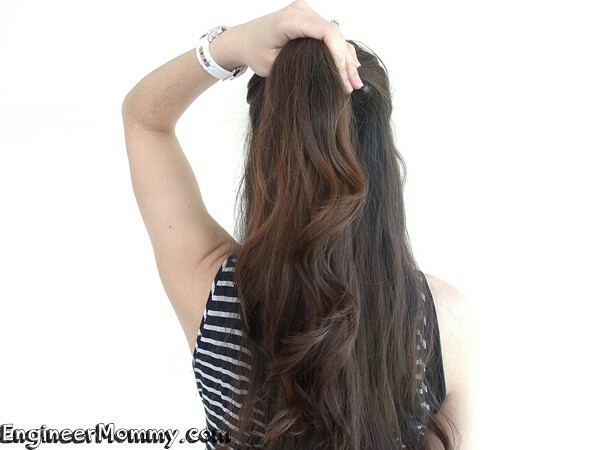 Use your fingers to spread out and loosen the curls. 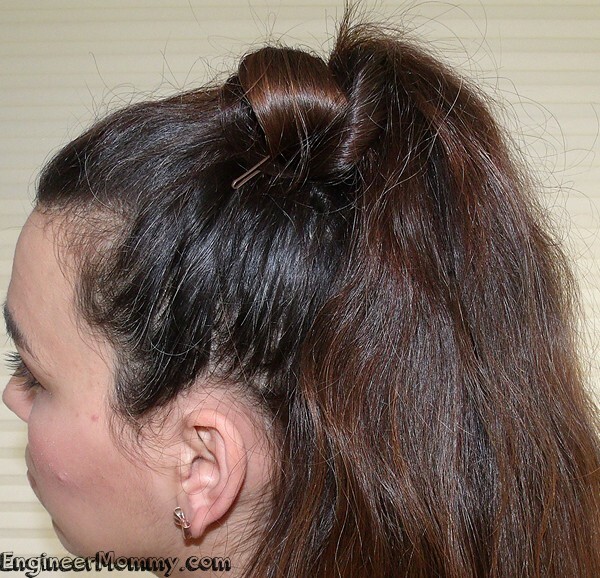 Take some hair from the sides of your head and bring it to the back. 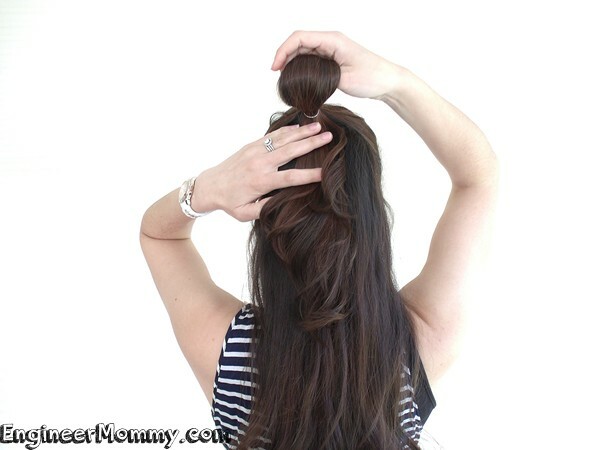 Using a small clear elastic, secure the little ponytail but don’t pull the hair all the way through. See the picture below for clarification. Finally, split the loop of hair into two sections and use bobby pins to pin the sides down. Your hair bow is complete! 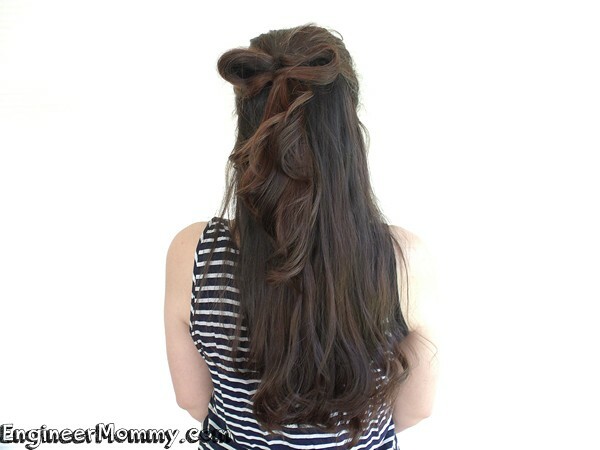 Isn’t this a cute way to dress up your hair? I’ve been using the Visibly Brighter™ Shampoo, Visibly Brighter™ Conditioner, and Visibly Brighter™ Treatment for a few weeks now and my hair definitely looks brighter and healthier! I’m so pleased with the results! 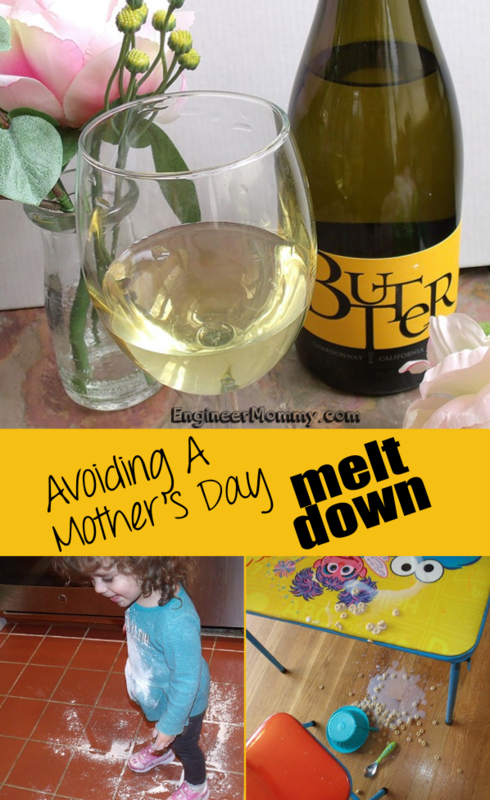 I’ve already recommended these products to my friends! 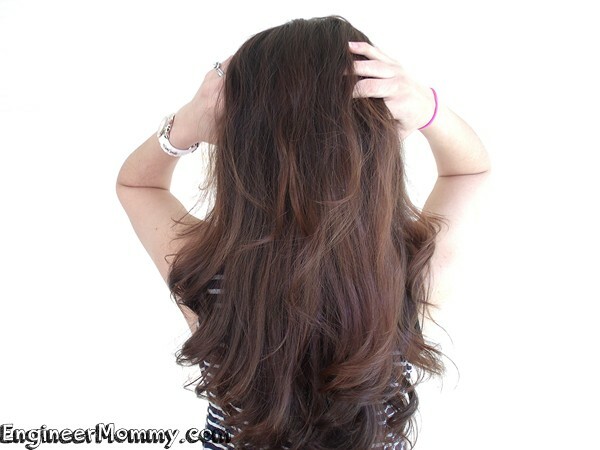 Here, take a look at this transformation comparing the Before hair and the After hair. Keep in mind that the results are even more noticeable in person! For more on how these products can enhance your own hair color, check out this video! I found all these products at my local Walmart store. Visit the hair care aisles of your local Walmart store to pick up the John Frieda Visibly Brighter™ line of products for yourself. Keep in mind that if you cannot find the products at your local Walmart, you can find them online here! Now, learn more about how the Visibly Brighter™ products can help you achieve beautiful hair colour at home and tell me: Have you ever tried creating no-heat waves? Would you love to avoid the high prices of a salon visit? How cute is your hair bow?! I was totally expecting a cloth hairbow but this is fabulous. Love your hair color as well. I am planning to go lighter for the summer. Your hair is so pretty and that hair bow is awesome! I love John Frieda products and it’s the only brand conditioner I use. What a cute hair style! Your long hair is very pretty. You can do so many different styles with longer hair. I have hair color in the bathroom waiting on me right now. I’ll have to check out the visibly Brighter products for next time. Your hair turned out really pretty. That “bow” in your hair is really cute. I also love the brighter color. It’s great for summer. That hair bow is so cute and I love that you don’t need to use anything except water. I need to try this out. Wow, I have seen these products before but really doubted they worked like they claimed. That is quite a difference. It looks so healthy and shiny. And the bow is adorable. Your hair definitely looks brighter now! I love your cute hair bow. That’s a really fun summer look! Your hair does look a lot brighter. I don’t color my hair but now I know what to use if I do decide to. BTW that hair bow is really cute. Oh I wish this would work on my thick curly texture. It looks good on you! You have beautiful hair! I so need to try this bow do on my daughter she would get a kick out of it! Wow! What a difference! Looks like the Visibly Brighter products really do a great job! Can’t wait to try out the bow tutorial on my daughter! The hair bow is so freaking cute, I’m totally going to try that on my daughters hair. She would love it. Love the hair bow idea. I wish my hair was long enough to try that! Love the hair bow! You have beautiful hair! 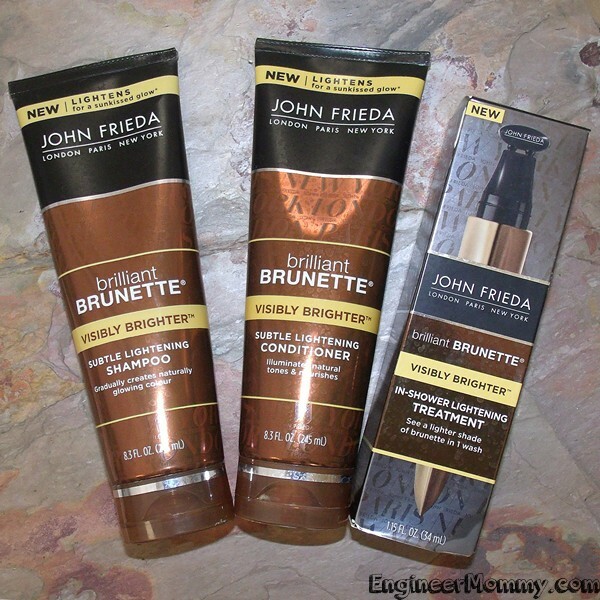 John Frieda makes really great products!